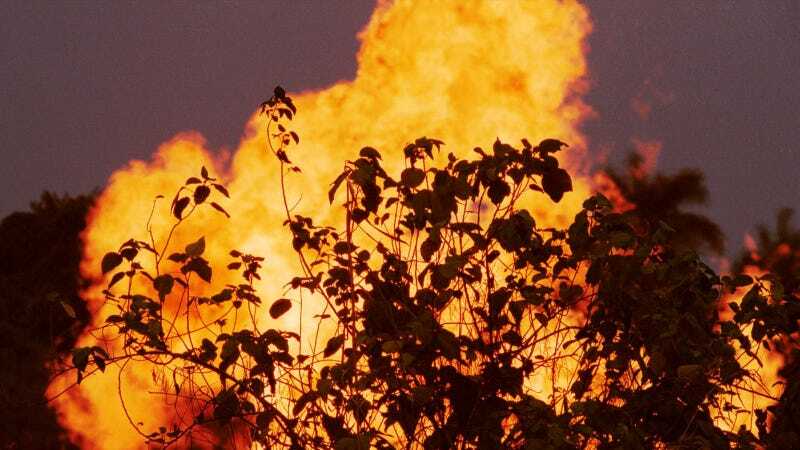 Earlier this week, militants in the Nigeria’s oil rich delta lands blew up the Nembe Creek Trunk Line pipeline operated by Shell, AGIP, and Oanda. The attack came just weeks after two other bombings that destroyed another major crude oil conduit, the Trans-Forcados pipeline. All three assaults are believed to be the work of the Niger Delta Avengers (NDA)—one of the new militant groups demanding restitution for what they claim are years of exploitation and environmental destruction in the Niger Delta by the government and international oil companies. Bombings like the one that crippled the Nembe Creek pipeline are particularly hard hitting for the Nigerian economy which relies on oil for approximately 92% of their exports. Despite the fact that almost all of this oil is produced in the Southern states of the Niger Delta, the region remains grossly impoverished and underdeveloped. For the 20 million inhabitant of the area, this often means living without the most basic needs. The NDA say they won’t stop attacking oil facilities until a greater portion of the oil wealth goes to the swampland region where it is produced. Two children sit on a rusted pipeline in the Niger Delta. Groups like the NDA represent the newest generation of combatants in this David-versus-Goliath fight against big oil, bred not only from the long-time struggle against the government backed petroleum industry, but also from a history of ethnic violence. These new militant groups are well armed and trained says Prof. Darren Kew Chair of the McCormack Graduate School’s Department of Conflict Resolution, Human Security, and Global Governance. Kew says that it’s too simple to view these militants as just freedom fighters or environmental crusaders and that while some may be motivated by a political agenda, many sometimes act like mercenaries or Mafioso thugs. Fynface Dumnamene Fynface, an Ogoni activist and program officer for the Nigerian NGO, Social Action, can understand why jobless and desperate young men would resort to violence, but thinks that these militant groups are just making things worse. A man and a women ride a motorbike though a polluted area of the Niger Delta. There are hundreds of oil spills in the Niger Delta every year, making it one of the most polluted places on the planet. Over the past six decades, these oil spills have transformed the once rich river delta into an unlivable wasteland. The air is toxic, the creeks lifeless, mangrove forests destroyed, and the fishing and farming industry, once a staple of the local economy, is no longer feasible. Fynface continues to appeal to the international community to help bring an end to the conflict and begin the cleanup of the region, but there seems to be no end in sight. November’s attacks came during ongoing negotiations between regional leaders and the Nigerian government, shattering a short-lived ceasefire. In response, the government has deployed a large military force in the Niger Delta, further escalating tensions in the region. While all this may seem like a far cry from the peaceful prayer ceremonies being held in North Dakota, echoes of Standing Rock can be heard amidst the explosions rocking the Niger Delta today. Much like the #NoDAPL protests, the conflict in the Niger Delta was borne out of non-violent campaigns that took place throughout the 1990s. The then military dictatorship responded by banning public gatherings, conducting military raids, mass arrests, and ultimately executing the writer and activist, Ken Saro Wiwa. Experts often attribute the brutal military repression of peaceful movements in the 1990s to the rise of militancy in the early 2000s and to the violence we see today. Fortunately, the United States is not under a military dictatorship like Nigeria in the 1990s—at least not yet. Water defenders at Standing Rock still believe that problems can be solved through democratic means, organized demonstration, and litigation; however, the aggressive tactics used by state police on peaceful protestors in North Dakota undoubtedly undermines the foundation that makes such non-violent protests possible. Could the scene at Standing Rock turn violent? “Surely it’s possible,” said Dave Cortez, an organizer for the Sierra Club coordinating Dakota Access pipeline protests in Texas. Michael Watts, a professor of Geography and Development at UC Berkeley is not so optimistic. With Donald Trump on his way to the White House, Watt’s thinks things are just going to get worse for Standing Rock protestors. “Given the fact it’s Trump, given what we think and what he has said his policy will be toward energy, you can well anticipate that these types of anti-pipeline activities are going to be seen with an enormous amount of hostility,” Watts said. Watts also pointed out that while Americans have been critical of the oil industry operating in other countries like Nigeria, the Standing Rock protest is the first popular movement against big oil to take place in the United States.